This Ultra Capacity gas dryer is equipped with the TrueSteam technology. This system uses steam in drying, making clothes free from wrinkles and odors. It has 9 drying programs and 7 special options, giving you more setting selection for different kinds of fabric. The sturdy stainless steel exterior is painted with attractive colors and fitted with a plastic control panel with LED display. Special dryer program called SteamFresh dries and refreshes up to 20 items in one load. Choose the Ultra Delicates program for the most fragile items, jeans and jackets can be dried thoroughly with the Heavy Duty cycle, while decorative pillows and stuffed toys can be sanitized using the SteamSanitary option. EasyIron setting dampens the fabric lightly making ironing a breeze. The Sensor Dry system determines the moisture content of clothes. If it senses that the clothes are dry enough according to the program setting, it automatically shuts off the unit. This saves a lot of energy and prevents damage on clothes due to over-drying. Its extra-large tumbler capacity can easily accommodate queen-size comforters. Dry several clothes at once for lesser number of cycles and lesser energy use. The door is made of durable transparent glass with chrome rim. It is fully reversible and can be opened either way. This is very practical for laundry rooms with limited space. The user-friendly electronic control panel is equipped with a small LED display to show the status and the remaining time of a particular cycle. Controls are available in three languages: English, French and Spanish. The control panel is made of plastic and is water-proof. 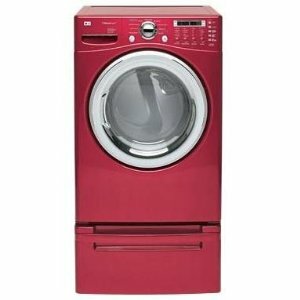 To save space, the unit can be stacked above a compatible washing machine model. Stacking kit will be provided for this. The exterior cabinet is made of durable stainless steel. Colors such as White and Wild Cherry Red add beauty to the unit. Large items like comforters and beach towels fit perfectly inside the unitís Ultra Capacity drum. More clothes can be dried at once, making it more energy-efficient. Even the most delicate of fabrics can be dried using the drying rack and the Ultra Delicates program. The SteamSanitary program sanitizes items by using high heat. Garments are refreshed with the SteamFresh program, giving you fresh-smelling and wrinkle-free clothes. The dryer has 9 drying programs and 7 options. The Sensor Dry system saves clothes from over-drying and makes the unit more energy efficient. NeveRust Stainless Steel is used for the drum, promising more years of use. To detect clogged dryer ducts, the unit is installed with an airflow monitor. The controls and LED display have 3 language options. It dries clothes quietly with the LoDecibel system. Elegantly designed, the unit is available in two attractive colors. Compared to electric-heated dryers, gas dryers are more expensive.